Friday, June 13 was the night of the Strawberry Moon, the Algonquin name for the full moon this time of year. We celebrated in Beacon two days later at the Strawberry Festival. Every morning lately I’ve been picking strawberries from our little patch on the side of the garage and throwing them straight into our cereal bowls. Also on nature’s calendar this month for the northern hemisphere was the summer solstice on June 21, where we enjoyed the longest period of daylight. On that night I attended a surprise 40th birthday party for a good friend. Although the days grow shorter, the days of ripest bounty are still ahead! Our most blatant seafood swap has been the abandonment of local American oysters for imported Asian shrimp. Once upon a time, most American Atlantic estuaries (including the estuary we now call the New York Bight) had vast reefs of wild oysters. Many of these we destroyed by the 1800s through overharvesting. But because oysters are so easy to cultivate (they live off wild microalgae that they filter from the water), a primitive form of oyster aquaculture arose up and down our Atlantic coast. 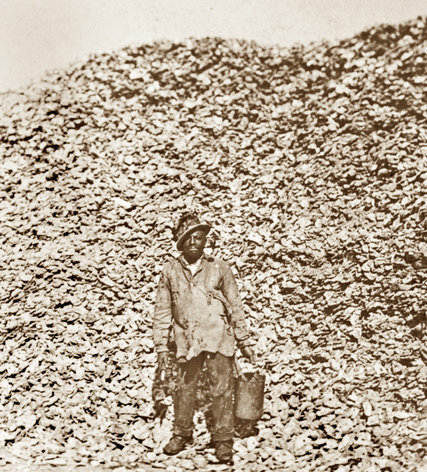 Until the 1920s the United States produced two billion pounds of oysters a year. 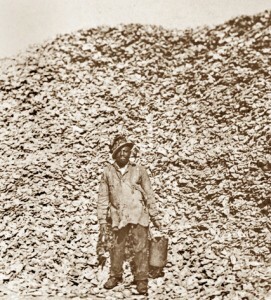 The power of the oyster industry, however, was no match for the urban sewage and industrial dumps of various chemical stews that pummeled the coast at midcentury. Atlantic oyster culture fell to just 1 percent of its historical capacity by 1970. Just as the half-shell appetizer was fading into obscurity, the shrimp cocktail rose to replace it, thanks to a Japanese scientist named Motosaku Fujinaga and the kuruma prawn. And so on, into the world of McDonald’s fish fillets and Chilean lox. Unfortunately, in terms of the molluscs in question, I subscribe to the view of Jonathan Swift, who said, “He was a bold man that first ate an oyster.” When I was a kid growing up on Long Island, my dad was a teacher. With five children, he could not afford to take summers off, so for a few years he tried his hand at clamming. He would shuck the clams with a special knife, squeeze on a bit of lemon (or not) and slurp them down. For reasons I do not pretend to fully understand, the exuberant noise he made has put me off raw seafood to this day. One year in the early 1970s the old wooden clamming boat, which he co-owned with several fellow teachers who counted similar numbers of progeny to support, sank in a storm. 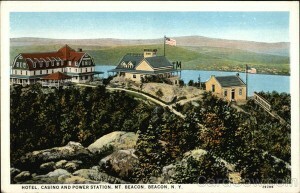 Commercial clamming on Long Island itself soon capsized, and by the 1980s had followed the oyster industry into demise. More recently off the Beacon waterfront, the Hudson River fisheries were officially shut down in 2010 after the collapse of the shad and sturgeon populations. While I did not develop a taste for raw shellfish, I did like my dad’s one and only claim to culinary expertise, Clams Casino. The word “casino” comes from Italian, where it is a diminutive of casa, or house, often in reference to a country cottage. So the dish is served on the clam’s little house. As it migrated to English, it took on the meaning of a building for social entertainment and dancing, then eventually card games and gambling. 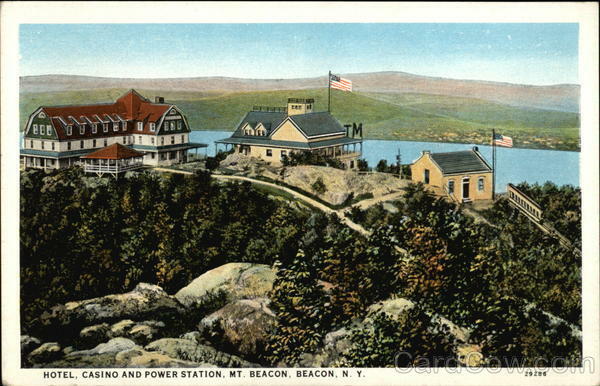 Contrary to what a council member stated at the last meeting, I believe the casino at the top of Mount Beacon was describing the more archaic use, and was mostly a dance hall. I could be wrong, though. In any case, no doubt a few card games, legal or not, were to be found in a back room now and then. The Casino, center, may or may not have had gambling, but its balconies featured search lights and high-powered telescopes. These days that meaning is long gone, and a casino is an industrial gambling space, one very similar to the next, complete with the biggest winners for the house, the slot machines designed to put customers in a zone. New York State is now taking bids on four casinos to be located somewhere within three Upstate regions. The professional hucksters from two casino resort developers made their pitches for locations in Orange County to the Beacon city council last week. I’ll spare the details for now, but much was made of their genuine concern for the City of Newburgh and its State-leading poverty levels, and how a casino resort at the junction of I-84 and I-87, or out on the Stewart Airport access road, will go a long way toward saving the city. Many millions of dollars were theoretically distributed, and the City of Beacon was promised hundreds of thousands simply for signing an MoU, or Memorandum of Understanding—basically a letter saying the city government is in support of the idea. Remember how your parents taught you about the theory of not getting something for nothing? When someone comes along literally throwing big money at you for the equivalent of “liking” them on Facebook, one would suspect it might be useful to pause for a moment and think—are there any hidden costs that might be coming my way down the road a bit? Just like the people who think they will beat the house odds, those who believe the casino business will contribute anything to the long-term health of the economy will also be played for suckers. It’s sad to see New York State resort to this. There are many reasons why it is a bad idea. For starters, if it is a healthy business, why not let mom and pop open up a little betting parlor, and keep it all local? No, you need millions to even have a chance at operating in this racket. I’ll leave it to you to research all the ills associated with this magical fix for broken economies. But before you even bother, ask yourself, How are the schools doing? What are my school taxes like? Because the State lottery solved all those problems, right? Don’t worry though, they will be different than all the other resorts, they will not be islands unto themselves, they will celebrate the Hudson Valley! Sorry, but building a giant hotel-restaurant-gambling palace at the “crossroads of the region” with no daylight allowed is not celebrating the Valley, no matter how many DIA:Beacon pamphlets you put in the mirrored lobby. 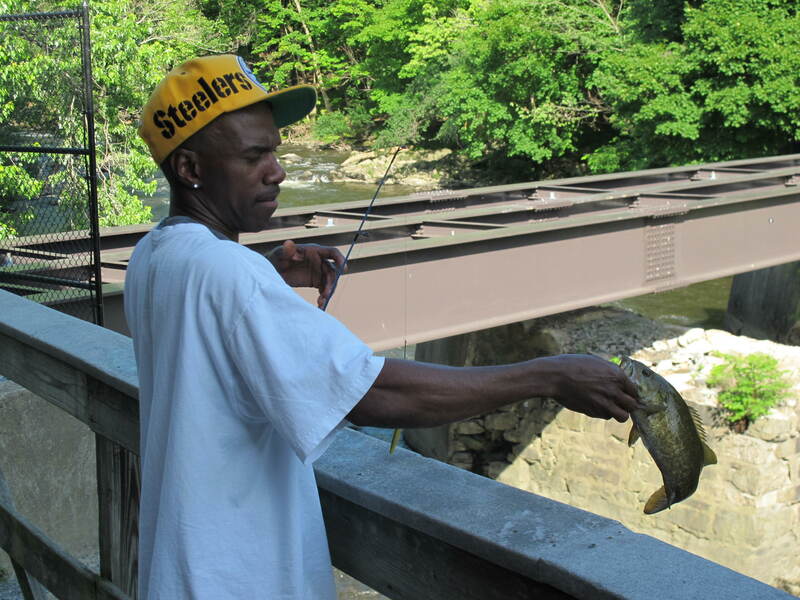 Feature photo: On the way back from the Strawberry Festival, I saw this angler take a young striped bass from the Fishkill Creek at Madam Brett Park. Here he releases his catch. That’s actually a largemouth bass. But I’m glad he threw it back.